G'day! We've just unleashed Pathfinder Player Companion: Wilderness Origins and if you follow me, we can take a look at this beautiful volume as it hits bookshelves and the digital downloads of paizo.com as a PDF. Now be careful as we take a peek inside! Now, the first thing you need to know about this book is that serves as a companion to Ultimate Wilderness. This book is your go-to source to expand on the content from Ultimate Wilderness with new archetypes, feats, magic items, and so much more. Shifters can look forward to new animal aspects, like the boar and octopus aspects, new feats that allow you to apply a weapon's properties to your shifter claws, and even a new system to replace your claw attacks with alternate attack types, like bites, gores, and talons. Shifters looking to expand beyond the animal kingdom can make use of specialized archetypes like the swarm shifter, which eventually allows the shifter to become several swarms of vermin at once! Players using the new races from Ultimate Wilderness can look forward to lots of options as well. Each of the three races receive new alternate racial traits to allow for further customization of these natural heroes. Gathlains can take feats that allow them meld with trees or call treants to their sides. Ghorans can harness the power of petals floating on the wind to create showers of blossoms that allow them to hide from their enemies. Vine leshys can extend their verdant natures to others, creating explosive growths that aid their allies! In addition to all of the options for these characters, we give a lot of love to our furry and scaly friends with new options for animal companions and familiars. Among these are several new archetypes. 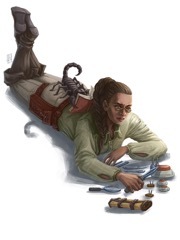 Some of my favorites include the apex species archetype for animal companions, which empowers your animal companion to gain extra abilities while in its home habitat, and the parasite archetype for familiars, which allows your familiar to attach itself to your foes and attempt to take them over! 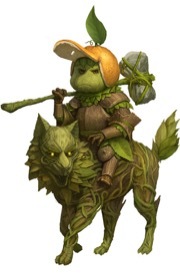 We also have lots of new feats for your companions and familiars and an expanded list of available animal companions for cavaliers, paladins, and rangers. Other characters that are looking to tap into the power of the wilderness have plenty of options to look forward to in this book. Among these are several new magic flowers, spells that call upon the might of natural disasters, and other class abilities that tap into the power of nature such as new arcanist exploits, barbarian rage powers, kineticist talents, and witch hexes. Whether you're just roughing it or have become one with nature, make sure to check out Pathfinder Player Companion: Wilderness Origins! I love the illustration with the scorpion reading!!! Grumpy leshy is so grumpy! Gonna make a cecaelia weretouched octopus shifter for maximum redundancy. Wow, this book and Ultimate Wilderness are definitely going to be my next purchases! That leshy art is especially delightful!